The Mariposa Biomass Project will operate the woody biomass-to-energy facility under the BioMAT program established in 2012 by Senate Bill (S.B.) 1122. S.B. 1122 established biomass-to-energy programs in three categories, Urban Waste, Dairy and Agricultural Waste, and the BioMAT program that would use “Biomass from forest byproducts derived from fire threat reduction, infrastructure clearance projects or sustainable forest management activities”. The bill required Investor Owned Utilities (IOUs) to buy a certain amount of power from these three categories at prices established via an auction program that the bill created. S.B. 1122 passed the State Senate 38-0, and the Committees in both houses that oversee utilities also approved the bill unanimously. It passed the Assembly with an overwhelming bipartisan majority. It was signed into law by Governor Jerry Brown in 2012. The goal of the BioMAT program was to establish a string of small-scale, < 3MW, biomass plants located in rural areas near the supply of forest biomass, with the intent of not only reducing the excess fuel supply in our forests, but also strengthening and diversifying local economies. Over the ensuing few years, a number of community groups, including North Fork and the Mariposa Biomass Project (MBP), started work to bring such biomass plants to their local communities and take advantage of the electricity pricing anticipated under the BioMAT auction process. In 2017 it was noted that despite the best intent of S.B.1122, not a single kW of electricity had been generated under the BioMAT program. This was largely due to efforts by the utility companies to make it difficult or impossible for small biomass groups to succeed, and indeed, in early 2018 not a single group had successfully entered the BioMAT auction queue. Fortunately, a number of state agencies, including the California Public Utilities Commission, and the State Legislature worked together with the Governor’s Tree Mortality Task Force to remove these barriers and force the IOUs to issue Power Purchase Agreements. Details of this struggle can be found here. The Mariposa Biomass Project (MBP) was formed as a 501(c)(3) in 2014, and we took on the other problem with small-scale biomass facilities--finding a technology that would not only meet California’s stringent air pollution standards, but that would be efficient enough to be profitable at the < 3MW size required by the BioMAT program. The problem was that the steam boiler/steam turbine technology, typically used for the 25-100 MW biomass plants in the Central Valley, does not scale down well to < 3MW, and those plants often struggled to meet air pollution standards. Such plants also use lots of water (400 gpm) and require highly paid licensed boiler operators to be onsite at all times. We looked at the small-scale pyrolysis technologies that create electricity and biochar, but our financial analysis indicated that profitable operation might be difficult, especially with the absence of a dependable market for biochar. After a year or two of looking at various technologies and guided by the Statewide Wood Energy Team and the Sierra Nevada Conservancy, we found Cortus Energy and its WoodRoll® process. The WoodRoll® process uses a 2-stage gasification system to create a high-BTU synthetic gas that can be sent to a reciprocating (piston) engine, such as the GE Jenbacher, designed to burn natural gas and synthetic gas from biomass plants. There are more than 17,000 Jenbacher engines operating around the world today. One of the best features of the Jenbacher engines is their advanced Best Available Control Technology (BACT) that allows them to meet the strictest air pollution standards, such as those in California. The Cortus WoodRoll® has the option of converting all of the potential energy in the wood into electricity rather than leaving some of the carbon as biochar. We chose this route, as it improves fuel efficiency, and we could get 20-year contracts for electricity generation. We found that the WoodRoll® has twice the fuel efficiency of small-scale steam boiler systems and has the added advantage of using minimal water. In 2016 MBP signed an agreement with Cortus Energy to develop a woody biomass-to-energy facility in Mariposa County. The MBP side of the agreement was to secure a location for the facility, acquire a planning grant to pay to obtain required permits and the System Interconnect Study with PG&E, and apply for a $5 million EPIC grant from the California Energy Commission. We applied for a Wood Innovation grant from the U.S. Forest Service and in 2016 were awarded a $240,080 grant that we have used for our county permit application including a full CEQA study. That grant also covered our System Interconnect Study with PG&E. To apply for the $5 million EPIC grant, we were required to have site control, and as a result we purchased property in the Mariposa Industrial Park. Our grant application, based on that specific property, included not only a letter of support from the Mariposa County Board of Supervisors, but also a letter from the Mariposa County Air Pollution Control District, written by the County Health Officer, and ratified by the Mariposa County Board of Supervisors sitting as the Mariposa County Air Pollution Control District. With our various grant applications we also obtained letters of support from a wide range of environmental organizations. In March 2017 the California Energy Commission not only awarded our project the requested $5 million, but also announced that we had the top-scoring application. That grant will fund actual work on the project, e.g., grading, with the stipulation in our budget that the money be spent in California. The beneficial effect of our project on air pollution cannot be overstated. Much of the excess vegetation and dead trees in the County today are either being open-pile burned or trucked long distances to biomass plants in Fresno or Sonora. 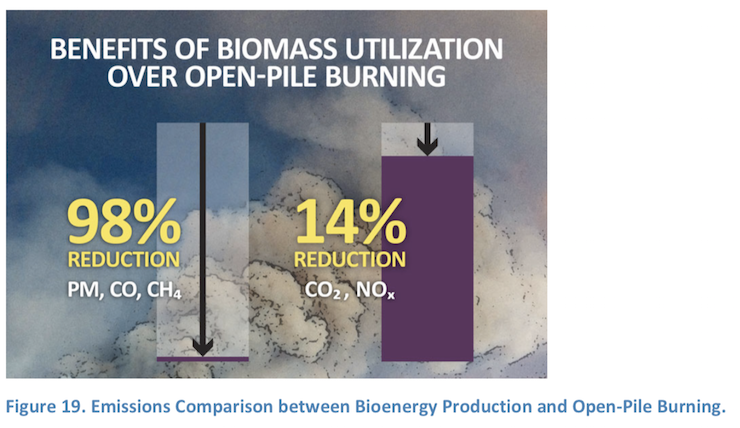 Research done by the Placer County Air Pollution Control District has shown that sending material to a biomass plant reduces carbon monoxide, methane and particulate pollution by 98% compared to open-pile burning. And that is with the older steam boiler technology. Our biomass plant will reduce air pollution even further. The California Association of Air Pollution Control Officers and every Air Pollution Control District in the state endorse and encourage biomass plants. Our traffic study found that by locating a biomass plant at the industrial park, the length of logging truck trips would be reduced 75 miles each way with the obvious reduction in diesel exhaust. These trucks are already on our roads, but the shorter the trips, the better. Additionally, the electricity produced by the biomass plant means that we don’t need to use a fossil fuel to produce that same electricity. This is especially true if the biomass plant is using dead and down wood of trees that need to be removed anyway for reasons of public safety, rather than cutting down live trees solely for the purpose of fuel. More about this and the issue of carbon neutrality here. We submitted our Conditional Use Permit application for the project to the County Planning Department in June 2017, and in February 2018, after we had submitted 600 pages of studies requested by the Planning Department, the Planning Commission granted our project a Conditional Use Permit. Unfortunately, that Permit was appealed, and the appeal, supplemental material and letters in support of the appeal coupled with public testimony suggested that our project would lead to the deaths of thousands of people in the area due to air pollution and toxic waste produced by the facility. 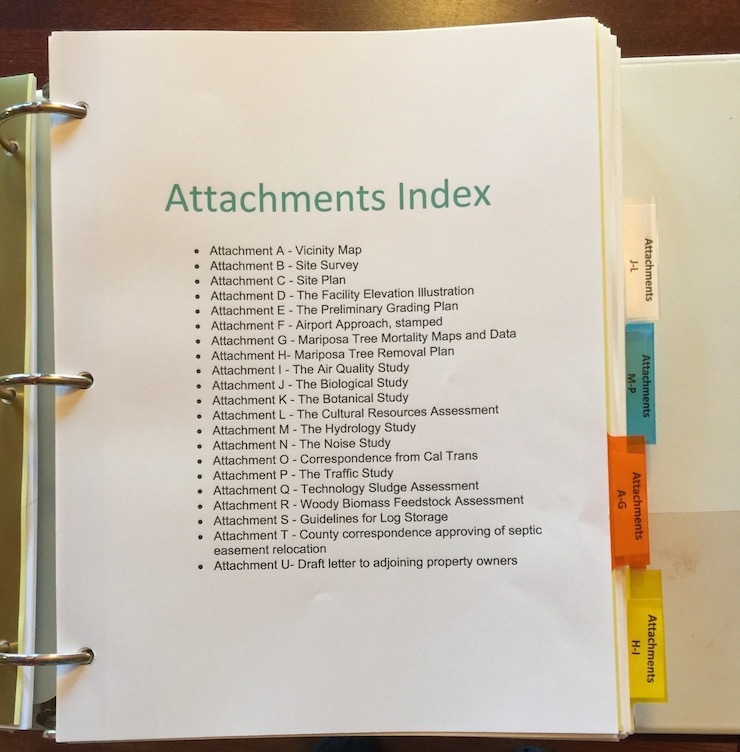 Given that the legislation that enabled projects such as ours passed the Senate unanimously and that State agencies such as the California Energy Commission, the California Public Utilities Commission and the Sierra Nevada Conservancy as well as Air Pollution Control Officers all support this and similar projects, one must ask what are the bases for those claims?